For years I have expressed my dislike of most of Daniel Libeskind’s architectural work. As an Architect I think that his home runs include the Jewish Museum in Berlin and the Felix Nussbaum Museum Extension in Osnabruck, Germany. Unfortunately, the majority of his work looks the same and even more unfortunately, it is unsuccessful as good architecture. Living in Denver, I’ve had to live with his design solution for the Hamilton Building at the Denver Art Museum. While I find it to be beautiful, it doesn’t work as architecture and additionally resembles some of his other work: Military History Museum in Dresden, the Royal Ontario Museum in Toronto. As a side note, I would have been much happier with Thom Mayne’s design. His latest, and inappropriate work, Century Spire, is a 60-story skyscraper in the Phillippines. Libeskind is on record stating the project will, “make a bold and optimistic statement about the future of the Phillippines”. In my opinion it makes very little statement at all. And I see no reason why this building couldn’t be located in a million other cities. There is nothing in the design which symbolically or otherwise represents the Phillippines to me. 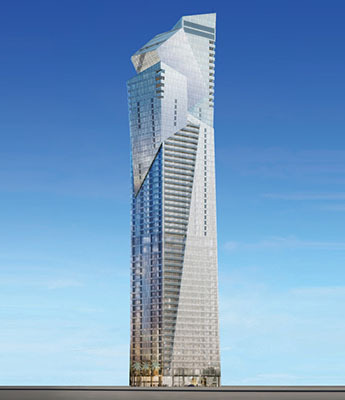 Daniel Libeskind designed the Century Spire to accommodate offices and apartments in Century City – a mixed-use development southeast of Manila. What’s unclear, in addition to the design itself, is whether Libeskind would find the comparison above objectionable. Whether he’s designing a Holocaust monument or commercial skyscrapers, he is remarkably consistent with his love for sharp objects. The aforementioned peak of the Century Spire will be broken into three segments, which the architect describes as a crown. To me it is a series of meaningless angles and diagonal lines. Using materials, he has applied his typical shards and facets to the skin of the building. All four faces of the building will gently taper in to the base of the building, making room for a landscaped entrance plaza. The building will house a mixture of one to three bedroom apartments, duplex units and penthouses. 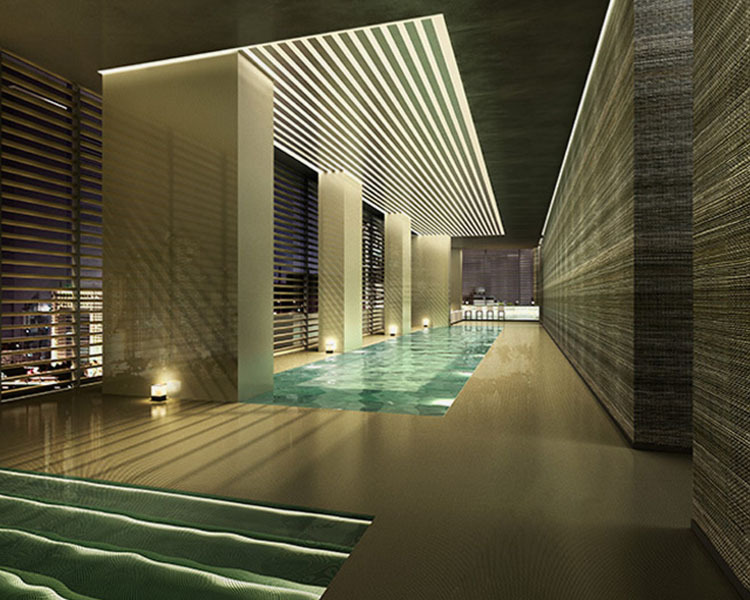 Amenities for residents will include a library, a swimming pool and a juice bar. It will also offer commercial office space for lease. The interiors of the Century Spire are the only real draw in my opinion. By Georgio Armani, they are classy and contemporary. They showcase something promising for the project, something the exterior just doesn’t live up to. Unfortunately, the interiors don’t speak with or to the exterior, there is a complete disconnect. I think the real problem here is the building talks about the architect. And while Libeskind might be someone’s favorite designer, this is a missed opportunity to build something which represents the people and pride of the Phillippines. 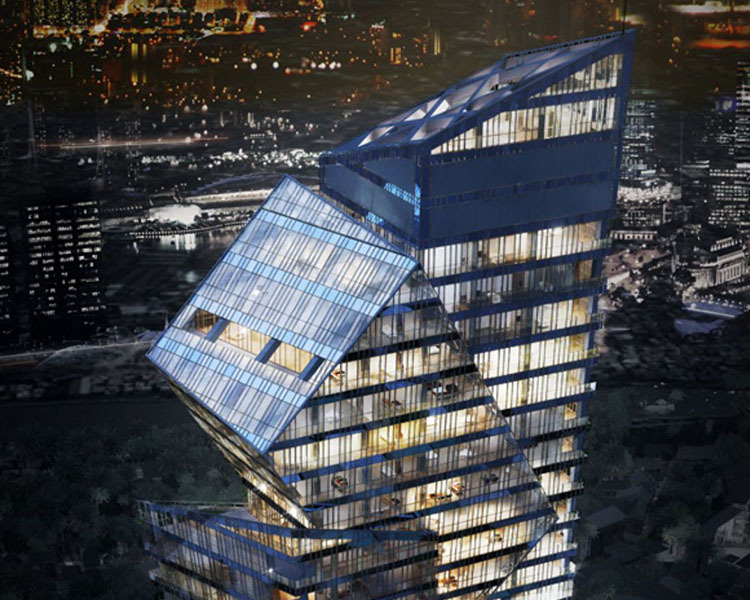 As would be expected, the press release says the building sings, that Libeskind has created another masterpiece. Not so in my eyes. The Century Spire is expected to be completed in 2018.